Preview clips for the DC's Legends of Tomorrow episode "No Country for Old Dads"
The episode is called “No Country for Old Dads,” and in the first clip, Damien Darhk learns that a smart mind just might be able to fix the fire totem… and of course, a smart mind is near in the form of an abducted Ray (Brandon Routh). But that’s not all! In another clip, Rip (Arthur Darvill) and Wally (Keiynan Lonsdale) arrive on the Waverider and share a scene with Sara (Caity Lotz) and Ava (Jes Macallan). You can see both of the clips below… official photos and a description for the episode can be found underneath the clips. 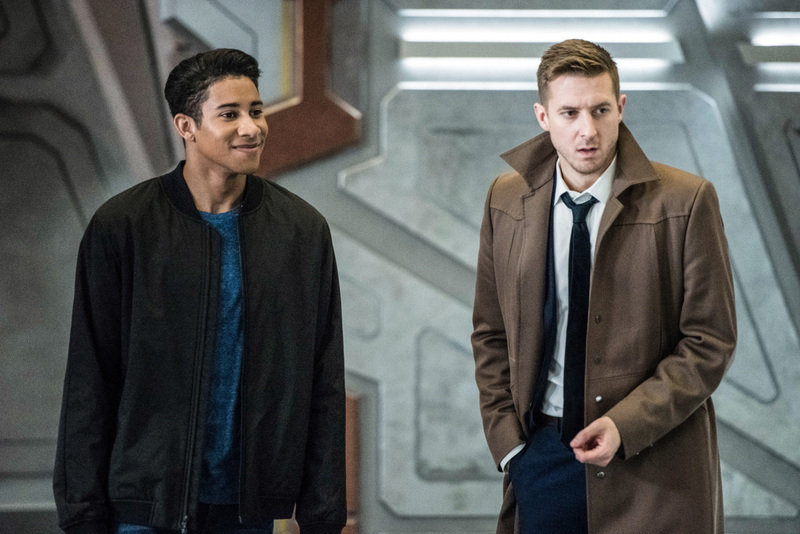 DC's Legends of Tomorrow -- "No Country for Old Dads" -- Image Number: LGN313b_0043b.jpg -- Pictured (L-R): Keiynan Lonsdale as Wally West and Arthur Darvill as Rip Hunter -- Photo: Dean Buscher/The CW -- ÃÂ© 2018 The CW Network, LLC. All Rights Reserved.